Eight miles from downtown, amid the warehouses and factories and railroad tracks of Bell, Corinne McAndrews plots out two rows of Purple Queen garlic. “I want to be part of a new way of thinking about urban agriculture,” she says of GrowGood, the farm she manages here. This isn’t a communal plot; it isn’t really a commercial one, either. GrowGood harvests food for people who are in no position to sort through the produce at the Santa Monica Farmers Market. Spread over one-and-a-half acres of U.S. Army land that a few years ago, she says, was “void of biological life,” its dozens of varieties of vegetables and herbs and 50 fruit trees serve as the engine of GrowGood’s mission: sending its harvest to the large homeless shelter across the parking lot. The farm was founded by Andrew Hunt, a technology entrepreneur, and Brad Pregerson, a city prosecutor. Pregerson’s grandfather, U.S. Circuit Court judge Harry Pregerson, helped open the shelter 28 years earlier in a converted U.S. Army hangar. Time as a volunteer in the kitchen inspired the younger Pregerson to find a way to get more fresh produce to the shelter. What’s ripe is picked, weighed, rinsed, and wheeled in a green wagon the 150 steps to the kitchen of the Salvation Army Bell Shelter, temporary home for up to 350 people, many of them military veterans. 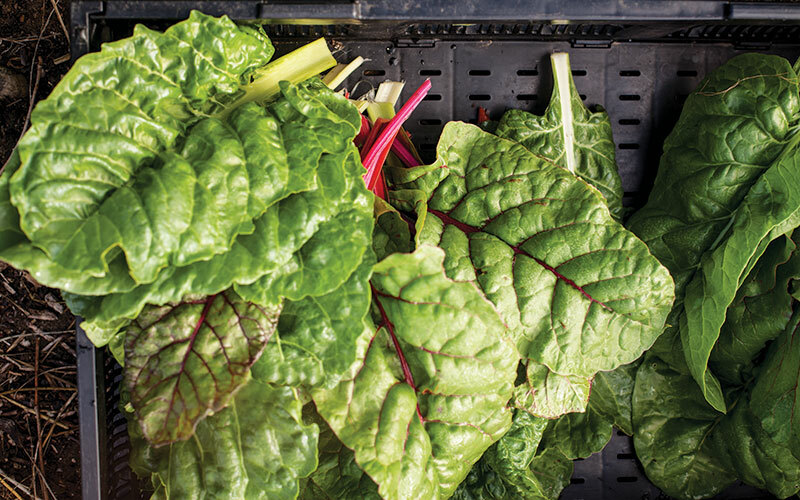 In early fall the wagon held rainbow chard, melons, tomatoes, hot and sweet peppers, and five kinds of squash. 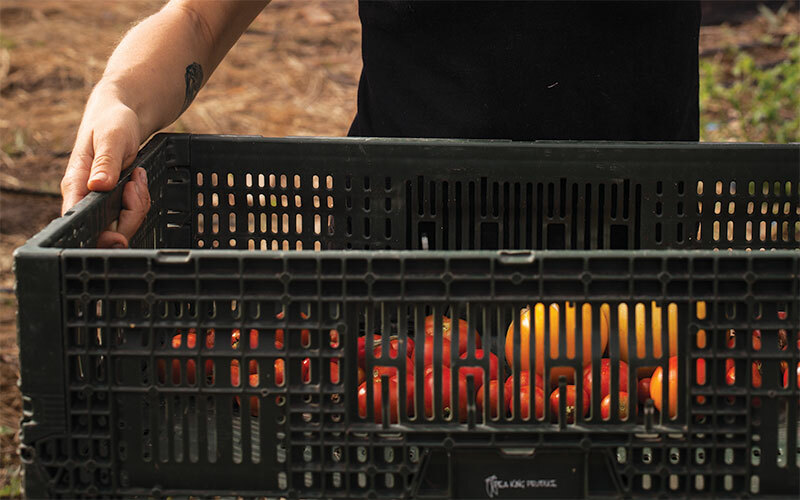 The farm will handily top its 2016 goal to send 6,000 pounds of food into the kitchen—one summer day alone, the harvest included 100 pounds of heirloom tomatoes. GrowGood is an earnest little place, populated by six employees and a dozen volunteers. Shelter clients sometimes volunteer or are hired as well. One, Joe Cobarrubio, frequents the farm to carve canes from found wood. Others find therapeutic value in hanging out among the greenery. “I’ve been obsessed with death since I was a kid,” says McAndrews, who is 27. It’s not a subject 7-year-olds—or even 27-year-olds—talk much about. But working with crops, which “die all the time,” gave her the chance to wrangle with concepts such as mu, the Japanese word for “the infinite potential of the absence of something.” McAndrews studied agro-ecology in college and, before GrowGood, tended land for wealthy Topanga Canyon home owners. A fan of unexpected plants that suit this climate, she’s often urging people to taste the sweetness of a dagga blossom or a delicate Aztec spinach leaf. So along with ordinary vegetables like beets and carrots, there are more exotic ones like Egyptian spinach, which is nutritious, hard to kill, and needs minimal water. On the downside, the shelter hasn’t quite taken to the spinach. The kitchen opens at 2:30 a.m. and uses GrowGood’s produce for the salad bar, stir-fries, and pasta sauces. But it’s not uncommon to see people piling their trays with chips or white bread instead. Farming is hard. Persuading people to change their eating habits may be harder. I made plenty of mistakes, like the time I wrecked a supply of summer squash seeds. And still, I was recently hired to work one day a week.